The issue at hand is that the federal government made payments for social programs using its public banks but it delayed payment to the same banks. That is, the federal government did not use its account at the central bank to credit the public banks’ account with the central bank while public banks made those social benefits payments. So, public banks made the payment (by creating demand deposits) and on the asset side there was an increase in credits (“loans”) to the Treasury (Case 2), which is forbidden by the fiscal responsibility law. In a “normal” transaction banks’ reserve balances (that is, government IOUs) with the central bank would go up, but because the Treasury delayed payments to banks there was in increase in balances owed by the Treasury to the public banks. This led the TCU to conclude that this was a “financing” operation. 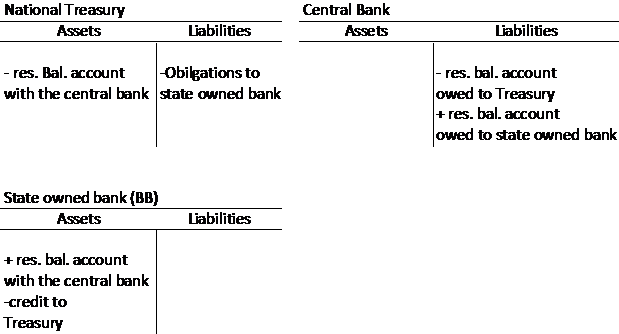 Note that the Fiscal Responsibility Law was initially drafted to avoid a situation in which state and local governments used their own regional banks to finance their expenditures (in Brazil there existed banks owned by local states). That is, it was as if the State of New York had its own bank but then public officials used them to finance their expenditures. In the 1990s, almost all state banks in Brazil were privatized and they put in place the Fiscal Responsibility Law in the year 2000 to avoid this situation at all levels of the administration (that is, federal, state, and local). The Treasury eventually made payments to public banks using its account with the central bank. So, the TCU rejected the government’s accounting practices due to those delayed payments because they have classified this operation as borrowing by Treasury from public banks. However, the fiscal responsibility law says that the federal government cannot borrow “money” from public banks, only from private banks via bond issuance. This misconception is based on the notion that sovereign governments have to borrow the currency from private banks at the market rate of interest, or else it would somehow be inflationary, since the federal government cannot spend by “keystrokes.” What did Federal Court of Accounts (TCU) miss? The monopoly issuer of the currency doesn’t need to borrow its own currency to spend (see more here: Rezende 2009). Moreover, the conventional belief is that not borrowing or borrowing from public banks is somehow inflationary compared to borrowing from private banks! But even in this case, they fail to recognize what a loan is: if a loan is a claim on the borrower’s assets, then how is that, operationally, different from government bonds held by private or public banks? In both cases, they represent a claim on the federal government. They are promises to pay. But promises to pay what? The government’s sovereign currency. Who is the monopoly supplier of the currency? The federal government… Though there is a law that says that the federal government cannot borrow “money” from public banks, this is another example of a self-imposed constraint; it does not make sense when it is applied to a sovereign government like Brazil (Rezende 2009). The root cause of this misconception is based on the fallacy of composition, that is, the failure to distinguish the federal government from other units such as state and local governments, firms, and an individual household. We both share the same opinion that lawmakers do not have enough knowledge about public finance and monetary operations – and that lack of knowledge leads to bad laws. And that is true not only for Brazil. We of curse may discuss if this sort of accounting manipulation is a crime and if it justifies her impeachment (I personally don’t believe in that). But the president does not have the right to bypass a law just because she thinks the law is inappropriate. And there may be a good reason to restrict “government lending” to bond operations with private banks: it gives more transparency. A government may hide lending operations with its central bank and with its public banks, and may even not include them in the so called government debt account. But it will be more difficult to hide operations in a bond market full of private participants. Article 36. Credit operations between a state financial institution and the member of the Federation who controls it, when the latter is the beneficiary of the loan, are prohibited. Sole paragraph. The prohibition mentioned in the caput does not prohibit a controlled financial institution from acquiring, in the market, government securities to meet its clients’ investment needs, or from acquiring government securities issued by the Federal government to invest their own capital resources. This is the contradiction. This misconception is based on the notion that sovereign governments have to borrow the currency from private banks at the market rate of interest. However, the monopoly issuer of the currency doesn’t need to borrow its own currency to spend. You cannot borrow something you can create yourself. The government always spends by issuing IOUs (obligations denominated in its own currency). This results in a debit to the Treasury’s account at the central bank and a credit to the receiving bank’s account. Note that both private and public banks can only buy government securities after the government has issued its obligations, that is, only after it has injected reserve balances into the system. This can be accomplished via government spending or via central bank lending. TCU’s allegation is not about transparency, but it is based on a misconceived on the role of taxes and bonds. You went to a good point. I may not be able to completely discuss this theme because I don’t fully understand some aspects about chartalist theory. ” You cannot borrow something you can create yourself.” In my mind, you can. For example, some companies sometimes borrow their own shares. But I don’t know if this comparison is valid. I could borrow my own IOU. It means that I temporarily will not owe anything to the IOU holder, but after some maturity date I will owe it back, with interest (I will owe more than I did at the beginning). We can discuss whether this kind of operation is useful to the government and the society. But I don’t see why you claim that it’s impossible. I guess I may be missing something. At least as I see it, when a government issues a bond, it is borrowing its own IOU. Then we go to a second point: the way institutions are arranged in Brazil and most countries. Government is separated into departaments, and each one of them are restricted to some set of laws. One of the rules that is common to most of these departaments is that they cannot issue currency. Usually only the Central Bank department (and/or the Treasury in some countries) have this “privilege”. There are laws that prohibits the Treasury from giving credit to the other departaments. Credit can be given only indirectly, through bond issuance to private intermediaries. For me this kind of law is just bad law, but one could argue that it helps to control the departments, including their accouting. But be it good or bad law, it’s law. Then there is the important point: can a delayed payment be considered a credit operation? Maybe it can, which means that the law as not fulfilled. If it can’t, then there is no law problems. You are still making the same mistake. here is what you said: “I could borrow my own IOU”. If you borrow, then you are issuing IOUs (debt). So, in your case you are replacing an IOU for another IOU. Your second point is also mistaken. In the current arrangement, the central bank issues reserve balances and paper money (that is, IOUs denominated in the state unit of account) while the National Treasury issues securities (also IOUs denominated in the state unit of account). Reserve account holders can only buy Treasury securities (IOUs) if they have enough reserve balances (IOUs) on their accounts with the Central Bank. So, effectively you swap an IOU for another IOU. Correct me if I’m wrong, but base currency (notes/coins/reserves) are in a difference place in the “pyramid of liabilities”. Base currency are like options with infinite maturity. The holder has the right to exercise the option to settle any taxes due, up to certain amount. If that option is exercised, the issuer (government) has the obligation to settle the taxes. So the currency is an obligation (liability) to the government and an right (asset) to the holder. But the bond is different. You cannot pay taxes with bonds. The bond is a promise to pay in a future date a certain amount of base currency. So it’s up in the ” pyramid of liabilities”. If you need to pay taxes, you will have to wait for the maturity or try you luck in the secondary market. They are both IOUs in different places in the pyramid. When the government offers bonds, it is giving more earnings for the holder, but it is also removing liquidity for the holder. This sort of thing brings implications to the economy. But that’s not exacly my point. Suppose that the “currency department” is not allowed to give more currency to the “defence department”, as limited by some budget law. But the defense dept is allowed to borrow from the currency dept, only if he promises to pay it back with interest. It will probably consume a future budget to pay for the loan, but that doesn’t seem to be a big problem. So the defense minister borrows currency. Because the defense and currency minister are firends, they agree to forget about the loan repayment. So the defense minister can do more projects in the future instead of consuming budget to repay loans. At the end of the day, the society will execute more defense projects than it was supposed to. The lawmakers don’t like it and they make a law that force the existence of a private intermediary (bank) between the departments. So the bank will borrow from the currency dept and lend to the defense dept. It will never agree to forgive the loan. The defense dept will issue a bond to the bank. It is not allowed for the defense dpt to issue a bond to the currency dept. After that, someone accuses the defense minister, saying that he is not obeying the law. there is one point that is not clear to me yet. Could I conclude from your arguments that there is no problem (and I don’t mean inflationary problems as we all know that the QTM does not hold) for the government to issue money whenever it is needed? So, for example, would you say that the Brazilian government could have printed money to pay for the expenses it made and had no resources to account for?